September 12, 2014 at 12:09a.m. 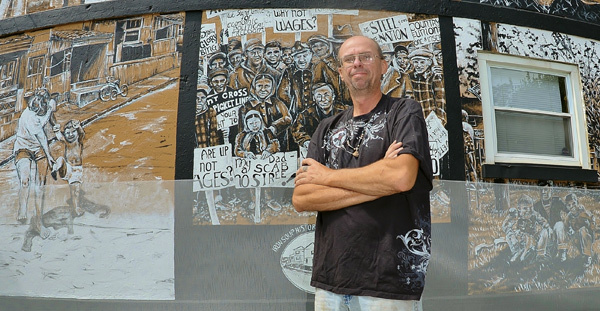 Tim Sokoloff , president of the Iron Soup Historical Preservation Company, stands in front of the mural on the side of 13 Delmar Ave. in Campbell. The mural was painted last month by artist Katelyn Gould, a city native who now lives in Pittsburgh. When Pittsburgh-based artist Katelyn Gould began painting her “Life in the Company Homes” mural Aug. 10, traffic in the 6-acre complex, which was built in 1918 by the Youngstown Sheet & Tube Co., increased rather noticeably. Since then, more than 500 people have driven through to check out the mostly black-and-white mural inspired by old photographs that now decorates the side of 13 Delmar Ave. Nearly 130 people showed up in just one day. Tim Sokoloff — president of the Iron Soup Historical Preservation Company, the nonprofit organization that owns 26 of the remaining 179 units and hopes to preserve and revitalize the national historic site that was built for steel workers and their families — said he’d like to see a comparable amount of people turn out for Saturday’s mural unveiling and benefit. The unveiling, which is free to the public, will take place at 5 p.m. at the mural. It will be followed at 6 p.m. by the benefit at 2 Reasons Grill and Bar, 6 12th St.; admission is $15 per person, which includes food, entertainment and a chance at prizes. Tickets can be purchased at the door. “I’m most looking forward to raising funds to bring more apartments back online and raising awareness about the [complex’s] history,” Sokoloff said of this weekend’s events. Sokoloff noted that the site is regarded as the world’s first modern apartment complex, and that each unit offered its residents countless amenities that very few working-class families then had access to, like hot and cold running water, gas and electric. The row houses, too, are unique in that they are made of prefabricated, rebar-reinforced concrete slabs and were assembled with cranes. Much of the complex’s history will be highlighted at ISHPC’s fledgling museum, located at 50 Chambers St. in a unit that retains many of its original fixtures and is being fully restored. A sneak preview will be available Saturday, said April Caruso-Richards, an ISHPC volunteer who is spearheading the museum effort. Numerous souvenirs — such as magnets, felt-bottomed coasters, tote bags, keychains and T-shirts, many of them emblazoned with images of Gould’s mural — will be available Saturday as well, added Linda Gens, ISHPC executive director. “This has stimulated so much interest,” Gens said, referring to the mural project, which Gould completed in eight days. Melissa Hines of Poland had followed the mural’s progress on Facebook. She called ISHPC’s mission “remarkable,” and one to which she can easily relate: Her family has been in the steel business since 1928. Wanting to help, Hines donated to ISHPC her grandmother’s circa-1920s Singer sewing machine and couture dress. Both items, which have been in her family “forever,” will be displayed in the museum. Like the museum, the mural will help future generations to understand the site’s significance. May 27, 2014 12:05 a.m.
September 11, 2014 10:55 p.m.
September 14, 2014 12:06 a.m.
August 19, 2014 12:05 a.m.